"Gumball Rally" redirects here. For other uses, see Gumball Rally (disambiguation). 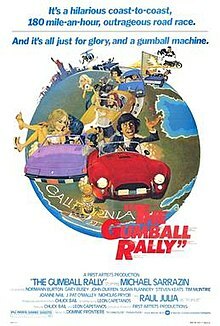 The Gumball Rally is a 1976 American comedy film directed and co-written by Charles Bail, a former stunt coordinator also known as Chuck Bail, about an illicit coast-to-coast road race. It was inspired by the Cannonball Baker Sea-To-Shining-Sea Memorial Trophy Dash run by Brock Yates, which inspired several other films, including Cannonball (1976), Cannonball Run (1981), Speed Zone (1989); as well as an actual event, the American Gumball Rally and Gumball 3000 international race. Michael Bannon (Michael Sarrazin), a wealthy but bored businessman and candymaker, issues the code word "Gumball" to his fellow automobile enthusiasts, who gather in a garage in New York City to embark on a coast-to-coast race "with no catalytic converter and no 55-mile-per-hour speed limit," in the shortest amount of time. There is only one rule: "There are no rules." Their longtime nemesis, LAPD Lieutenant Roscoe (Normann Burton), also learns of the race (no explanation of how he learns of it is provided). Most of the film is devoted to the adventures of the various driving teams and Roscoe's ineffectual attempts to apprehend them. A number of running gags ensue – the Jaguar that will not start; the silent Lapchik's (Harvey Jason) numerous mishaps; Italian race driver Franco Bertollini's (Raúl Juliá) frequent detours to seduce beautiful women – as well as some stunts and driving sequences. The race ends at the Queen Mary in Long Beach, California where the finishers celebrate their adventures and the defeated Roscoe sulks off to one side – until a fleet of police cars and tow trucks, summoned by Roscoe, arrive to impound the Gumball vehicles. Roscoe had contrived to see to it that all of them were guaranteed to be illegally parked once the post-race party in the parking lot ran past 11 PM. Bannon congratulates Roscoe on his final victory (final because Roscoe, who has been after Bannon and Smith since they were in high school, has reached mandatory retirement age) and again utters the command "Gumball" to initiate a race back to New York. Porsche 911: Completed race. Third place by parking of cars. Mercedes 300 SL Roadster: Completed race. Kawasaki Motorcycle: Completed race. Last competitor to finish. Camaro: Did not finish. Wrecked on LA Freeway. Chevrolet Van: Did not finish. Caught fire and wrecked in fireworks factory. Corvette: Did not finish. Wrecked in New York City. Jaguar XKE: Did not finish. Failed to start and never crossed the starting line. Rolls Royce: Not an official entry. Did not finish. Delivered to owner in Beverly Hills; brakes failed in driveway and Rolls crashed into pickup truck. The spirit of the Gumball Rally has inspired road rally enthusiasts to create local versions of the Gumball in individual states. There are annual Gumball Rallies in Michigan, Florida, and California. The rules of these races are more stratified than the movie, and speeding or demented driving is discouraged. But anyone who can afford the comparatively modest entry fee and acquire sponsors can enter any sort of vehicle in the competition. Like a road rally, the state Gumballers have to pass through checkpoints over the course of the race, which runs for an entire weekend. There is an elaborate formula not known to the competitors for determining the winner of the Rally. Part of the Rally's mission seems to be to promote state attractions and businesses, but the idea still seems to be having a great deal of fun while doing so. An international version of the Gumball called the Gumball 3000 was created by a Briton, Maximillion Cooper, as a 3000-mile race through multiple countries. How one enters and what the rules may be are not clear, though it appears checkpoints are involved. However, most of the drivers appear to be celebrities of various sorts, and the entry fees are rumored to be substantial. The Rally often partners with charities such as the Wounded Warrior Project as a fundraising event. The one thing that the Gumball 3000 has in common with the original Gumball Rally is that any sort of vehicle can be entered. Past entries have included a Blower Bentley, a 1965 Aston Martin DB5, a Winnebago RV, and an ex-New York Police Department Ford Crown Victoria in NYPD livery. Prizes are awarded for best time, most original car, for special actions during the race, and to whoever best exemplifies the good-hearted spirit of the event, the coveted "Gumball Spirit Trophy." In 2010, a rally similar in concept to the Gumball 3000 but confined to the State of Texas called the Texas Outlaw Run was conducted. As of 2013, it has not been repeated. At Disneyland and Disney World, once a year Disney fans hold what is called the MiceChat Gumball Rally. The objective is simple: to ride as many rides in Disneyland as possible in a single day. The winning teams are presented with medals and have bragging rights forever after; and the grand prize is a gumball machine topped by Cinderella's Castle, obviously inspired by the movie's Gumball Trophy. As noted above, The Gumball Rally ushered in a subgenre of road-race films, many of them starring a younger Burt Reynolds, one of whose more popular films, Smokey and the Bandit, spawned a still-ongoing yearly rally event called The Bandit Run. ^ http://onthesetofnewyork.com/thegumballrally.html. Retrieved July 10, 2017.